City of Industry, CA - California Steel & Tube, a manufacturer of high-quality welded mechanical tubing for automotive, metal furniture and construction applications, and roll-formed sections for metal building components, cabinets and medical equipment, among others, has installed a high-performance Single-Loop Turret Head™ Slitting Line to generate slit coils for its welded tube mills and roll formers in its City of Industry manufacturing facility. 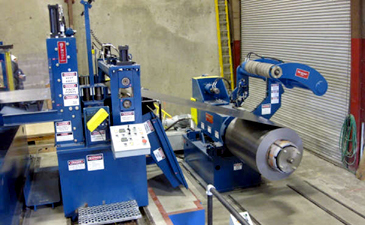 The new slitting line assures California Steel & Tube's ability to deliver high-quality slit coil to its production equipment. 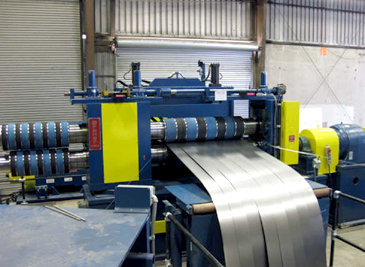 The new California Steel & Tube Slitting Line has the ability to process 40,000# x 60" wide carbon steel coils in gauges ranging from .024" through .135". The line is equipped with Entry & Exit Coil Storage Turnstiles, Entry & Exit Coil Cars, Crop Shear, a quick-change precision Turret Head™ Slitter, quick-change Strip Tensioner, and a Recoiler capable of generating strip tension necessary to produce tight, straight-walled coils. 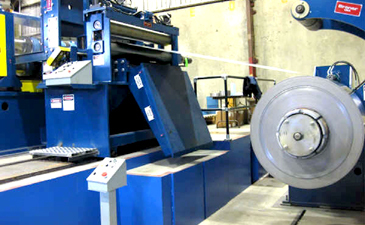 40,000# x 60" x .135"/.024" Single-Loop Turret Head™ Slitting Line at California Steel & Tube. Compact Hi Pass Line Arrangement: The California Steel & Tube Slitting Line is an example of Braner/Loopco's high-performance compact high pass line system that positions the Uncoiler and Recoiler at floor level with the strip processing equipment elevated above the largest coil OD. That arrangement eliminates reverse-bending of the strip against the natural coil-set as the coil is threaded and processed, which results in faster strip threading and the elimination of coil-breaks induced by reverse strip bending. The high pass line arrangement causes the strip to run over all line deflector rolls rather than under; therefore, common strip surface scuffing and scratch damage is eliminated. With a compact Uncoiler to Recoiler centerline dimension of 37-feet, California Steel & Tube's slitting line offers quick and efficient coil threading and superb coil tracking and coil side-wall build-up while occupying minimal floor space. The Compact Hi Pass Line arrangement allows quick threading, elimination of induced coil-breaks, provides superb strip tracking, and reduces the line length to 37-feet. Entry Coil Prep Station: The Coil Peeler, Pinch Rolls, Automatic Edge Guide, Side Guides, and Crop Shear are installed close to the Uncoiler on a compact common base immediately ahead of the Turret Head™ Slitter. The unique Entry Station design makes heavy and thin gauge coil threading quick and easy while providing excellent coil tracking at high processing speeds. A laser beam master coil alignment and electronic Side Guide position readouts reduce coil set-up and threading time. Entry Station combines entry coil threading and guiding equipment into a single compact machine that speeds coil threading and improves strip tracking.